Sequels are not always a good thing, but this one is an eagerly awaited follow-up to Yelton and Salmon’s Anglican Church-Building in London 1915-1945, also published by Spire Books in 2007. The gazetteer arrangement of the first volume has been retained, though in a smaller format, with a short textual description and a small black and white photograph of the exterior and interior of each church. It covers all the new and substantially rebuilt C of E churches in Greater London since 1946, in five dioceses (London, Southwark, Rochester, Chelmsford and St Albans) but arranged by London borough. The task was much greater this time, with an astonishing 250 churches. Roman Catholic churches are not included, however, and these really need a volume of their own, as so many interesting ones were built in London in the 1950s and 1960s. There are various reasons why so many churches were built in this period: the completion in the mid 1950s of churches started before the war, once permits allowed church construction again; the replacement of a large number of South London churches destroyed by flying bombs; new post-war outer London settlements such as Northolt, New Addington and Harold Hill; and – by the 1960s and 1970s – replacing Victorian churches too large for their declining congregations with more manageable modern versions. Even some of these replacements have since closed or been demolished because of demographic change. Yelton cites Southwark Diocese as overly ambitious in its post-war replacement programme in inner South London, with a number of 1950s churches closed or deconsecrated: particularly a couple by Thomas F Ford in a neo-Regency style and embellished with murals by Hans Feibusch (on which I am leading an event on 5 October). However, seven of their collaborations remain open for worship in Southwark Diocese (and one in Rochester). Yelton’s take on the churches is that of a Catholic churchman rather than an architectural historian. He stresses in his introduction that innovative churches reflecting the thinking of the Liturgical Movement are very much the exception, such as the Grade I listed St Paul’s, Bow Common by Maguire and Murray. 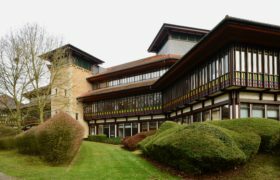 The Society visited this last year with Robert Maguire (to celebrate publication of the Society’s monograph on these architects by Gerald Adler). Their austerity and asceticism did not universally appeal. Far more typical of Anglo-Catholicism are refined expressions of churchmanship in a pared-down Gothic or Romanesque by established inter-war practitioners such as J Harold Gibbons (working until the 1950s) and Cachemaille-Day (until the 1960s). The book includes churches by architects I’ve never heard of before, such as the prolific R G C Covell in the 1950s and 1960s and M Biscoe and Stanton in the 1970s, which would no doubt repay further study. My only criticism is that the promise of the cover – with its excellent colour picture of the corona and rood of the threatened St Mary and St Nicholas, Perivale (by Laurence King) – is not fulfilled by the contents. The quite small black and white illustrations do not always do full justice to the interiors. Nonetheless, this is an invaluable source for the Society’s church casework and the thematic review of post-1914 churches which the Society is undertaking. As part of this, we hope to produce an update of the list of Christian places of worship, 1914-1990 which appeared in the (now out-of-print) C20 Society Journal No 3.